My Aunt Elizabeth makes the most amazing rice krispie treats! She has been making them for our family gatherings since I was a little. One of the things I love the most about her rice krispie treats is that she always put M&M’s in them. After the blessing on the food, my cousins and I love to make a mad dash for the plate with her M&M rice krispie treats. I must admit that there might have been a few times that I snuck one before we were even ready to eat. Her rice krispie treats are always so soft and gooey with a hint of that rich butter flavor. Then as if that wasn’t enough, she always added M&Ms to them. I don’t know about you, but I am a strong believer that anything tastes better when chocolate it added! Over the years, I have tried and tried to duplicate her recipe. My rice krispie treats never turned out like hers. Mine were either too dry and bland or so gooey that they wouldn’t even hold there shape. So one day I asked her what her secret was. She told me that she melts the butter and marshmallows in the microwave. She never melts the butter and marshmallows on the stove top because doing so tends to dry the rice krispie treats out after they are mixed in. She uses a 16 oz. bag of marshmellows and 6 to 7 cups of rice krispie treats. I was surprised at how simple it was. You can even switch out the milk chocolate M&Ms for other flavored M&Ms. My husband and my boys love them with peanut butter M&Ms. This is the only recipe I use now and my rice krispie treats turn out perfect every time! So today, I am sharing her amazing recipe with you. 1. In a big microwave proof bowl, melt the butter and marshmallows together in 30 second intervals, stirring in between. 2. Once the marshmallows and butter is completely melted and thoroughly mixed together, add the rice krispies. Gently fold the rice krispies into the marshmallow mixture. 3. 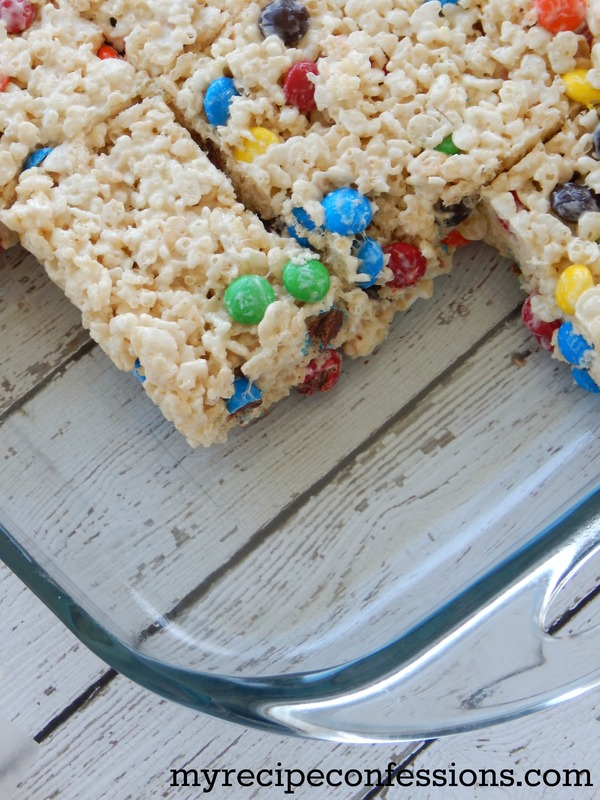 Fold the M&Ms into the rice krispie mixture. Spray a rubber scraper with baking spray and scrape the rice krispie mixture into a greased 9 x 13 pan. Spread the rice krispie mixture out evenly in the pan. Gently press the rice krispie treats down with the rubber scraper to help compact them a little more. *I like to let them rest for about 1 to 2 hours before I cut and serve them.